Although pretty in flight, if you're a grower of cabbages, broccoli or any other brassica, this butterfly will get your blood boiling. 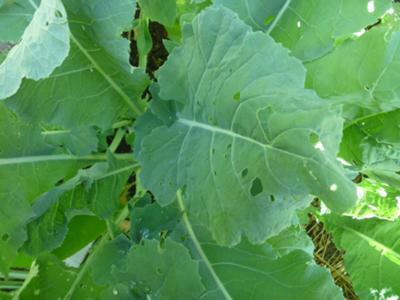 This European import is a destructive pest, making lace out of your best crops of any of these related plants. 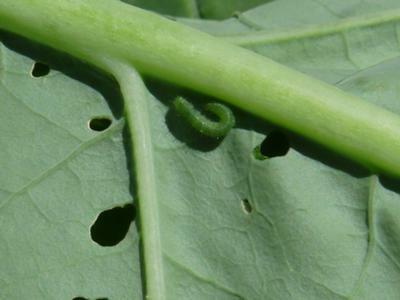 The adult is very fluttery, and extremely hard to photograph, and the larva are tiny green caterpillars and rarely seen until the damage is done. They will eat huge holes in the leaves, and leave behind their frass or droppings, making it inedible. 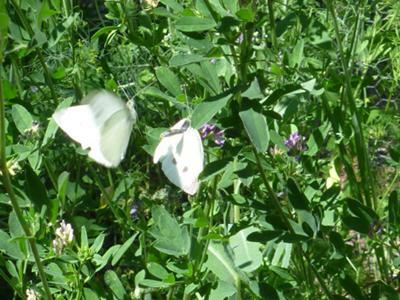 If you see these fluttering white butterflies in your vegetable garden, make sure you rinse your broccoli in salted water for a few minutes to get the caterpillars out. A sure fire way to prevent damage is to cover your crop top to bottom with row cover to keep the adults out. You can use Bacillus thuringiensis against the larvae, which is a naturally occurring bacterial infection which gives them a tummy ache, and eventually they starve to death. I'm unsure if this has an effect on other more desirable types of butterflies, so I don't use this method, but it is considered to be an organic form of pest control. I've used one called Reemay, which is spun bonded polyester. It's light and easy to put on. However, after a season or two, it tends to get holes in it, so you'll end up with smaller and smaller pieces. I bought mine years ago at Lee Valley Tools, but if you have a good garden center or Home Hardware store near you, they'll have it. Hi Deanna, I've seen the butterflies as early as the beginning of June, but it can be earlier if the weather is warm enough for them to hatch. It all depends on the season. Start your protection efforts early - even after you see an adult, you will have a couple of days before they get down to the work of mating (it's the caterpillars that eat your plants).